I got to meet Nadia Bolz-Weber. By ‘meet’ I mean that I got to hear her speak, and then I got to have her sign a copy of her newest book while she studiously avoided making eye contact with me. We had each been given a sticky note to fill out before she arrived with our name so that she wouldn’t have to “waste time” on that. She was ushered in to the book signing by several assistants, and as soon as she sat down, she started whipping open the books set in front of her with startling efficiency and with her body language inviting as little engagement as possible. It became obvious that this was strictly about the autograph business; this would not be a chance to chat. Nadia, for those who don’t know, is one of the more famous Christian authors and thinkers in the world right now. She officially styles herself as a “public theologian,” which means that she writes and speaks for a living. She became famous for two things in particular. She was a successful Lutheran Church planter (“Lutheran church planter” are not three words that are often linked together, so there was a definite element of novelty) in Denver, Colorado, founding the unique church community The House for All Saints and Sinners. And she is a tattooed recovering alcoholic who is able to speak in such real and honest language about faith and her life with God that broken people the world over feel like they are hearing the invitation to walk with Jesus for the first time. I had heard her speak twice on the weekend ahead of the book signing, and she was funnier, wittier, more insightful and touching than I could have hoped for. I wanted to meet her. I wanted to meet her in a way that I don’t usually want to meet celebrities. There is nothing I could imagine needing to say to a George Clooney or Amy Adams or any other Hollywood celebrity, but I had a long list of things I was dying to chat with Nadia about. I imagined us discussing the joys and heartbreaks, challenges and blessings of leading a mainline church community today, to throw ideas back and forth about how you grow and discern and respond with your people. More particularly, I hoped we could talk about writing, especially about some of the overlap I see between her latest work and mine, both of us naming in the life and message of Jesus a corrective to the bad messages we receive about ourselves and our bodies. Nadia has the kind of stage presence and writing voice that suggests she is having these kinds of conversations all the time, that she is open and accessible for dialogue. We were both speakers at this same inaugural festival in Austin, Texas, and although she was the paid ‘main event’ at the festival, and I was leading in a mere workshop in one of the side rooms, I thought that it was at least a possibility that our paths might legitimately cross. Nadia’s level of celebrity no longer allows her a chance to “cross paths.” To be clear, I fault Nadia for none of this. I was not disappointed in her because of her brusque manner at the book signing table. I haven’t witnessed the cost of celebrity up-close like that before, so it surprised me, but it’s not a huge imaginative leap to understand that her health and well-being depends now upon her guarding herself from all of the people like me who think they know her. I wasn’t disappointed, but I felt incredibly sad. There were other things that she said in her addresses that amplified my sadness. Nadia’s life has changed immeasurably and very recently. As she named for her audience, she has now had to leave her life as a pastor to her beloved church because her life as a public figure has taken over. She no longer worships at, or belongs to, House for All Saints and Sinners either, because when you leave a church, you have to leave that church. She hasn’t been able to find a new church because House has essentially ruined her for more traditional mainline offerings. She named to her listening fans that she was so successful in what she did as a church planter that the cost of that success is that she no longer gets to be with them. As a culture, we spend an inordinate amount of time fetishizing celebrity. They epitomize the “American Dream” for us (which we in Canada buy into to a grand degree as well): the idea that anyone from anywhere can land themselves in positions of fame and fortune. We are encouraged to assume that these two things, particularly when they occur together, represent the pinnacle of success and achievement, and that any of us, if we had the chance, would leap happily into that kind of life too. It’s a unique, and rather rare, thing for a celebrity to also be a religious figure. But as a religious figure, Nadia reveals something to me about fame that I didn’t understand before. It is costly in all of the same ways that it is costly for any of us who take our faltering and imperfect steps into following the summons of our Lord. This is important because it is so easy to assume that there might be levels of personal security, of wealth and of admiration, that catapult a person beyond the needs that the rest of us have. It is easy to assume that this is what we’re all trying to find: our own little niche of achievement and completeness that lets us simply breathe easy and rest secure. 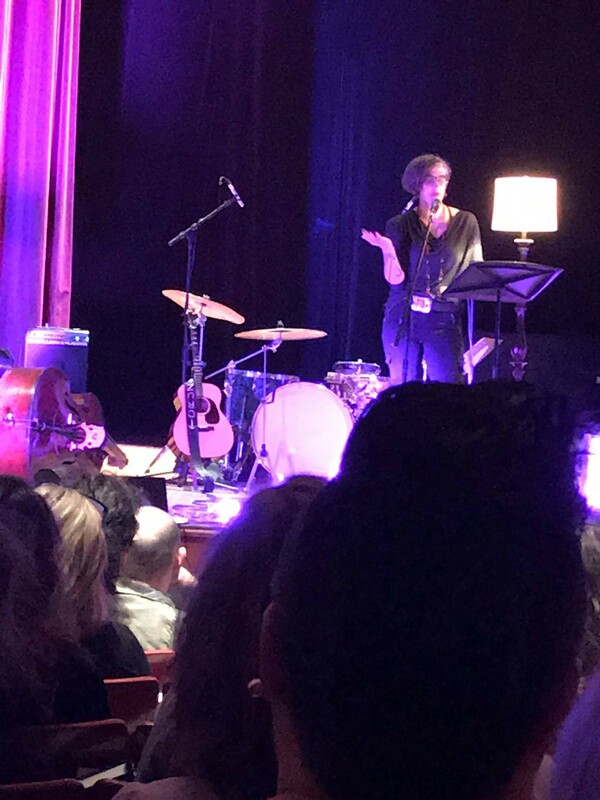 What I saw instead in the guarded look of Nadia Bolz-Weber is a person whose smallness, incompleteness and neediness is more exposed than ever. This is a good thing, in fact. I imagine that it is only through prayer that she can keep track of her own limitations and need, and not buy into her own press of how she’s “made it”; only through the cross that she can sacrifice so much of what she herself loves for the sake of becoming a public mouthpiece for the invitation to faith; only through joining her life again and again into the New Creation seen and offered in Jesus that she can receive that grounding love that all of us need in order to live and move and serve and not shatter apart in the face of all that life demands of us. Jesus does make a promise when he calls us. He tells us that we have to be willing to pick up and carry our cross. We all have one, we all have that heavy load of desperation and worry and pain and incompleteness that we carry around. We are not for a second to imagine that we follow Jesus in order to somehow transcend our own neediness, to land ourselves into some utopian assurance of safety and security, to become miraculously a finished product. But he also very clearly tells us that if we are willing to lose our lives, we will discover what it is to live. It is a Eucharistic promise I hear: Jesus will take our offering, break it open with love, and give it back to us with illuminated by the presence and promise of God, revealed as beautiful and holy. God has called Nadia Bolz-Weber into this life of celebrity and public witness. She is able to speak God’s love into all kinds of places and people not usually interacting with that voice of faith, and not used to hearing that voice of faith spoken in words like Nadia’s. I give thanks for this — for the parts of her own life she is willing to sacrifice to allow this to happen, and for the grace of God clearly working in her. I pray that she continues to experience in this wild world of celebrity God’s enduring promise of abundant life. Martha serves as the rector of St. George's Anglican Church in St. Catharines. Her book "The Living Diet" is set to be published in 2019.